Dave Cohen’s book about comedy writing doesn’t have any of the answers. But it does have a lot of questions – and that is probably more useful to an aspiring scribe trying to figure out what’s wrong with their script or in need of a bit of inspiration. For anyone putting ‘become a sitcom writer’ on their list of new year resolutions, there are plenty of pointers here to focus the mind: from considering the underpinning meaning of what the show’s actually about to figuring out the personality flaws of the central character which means they won’t get what they think they want - let alone what they really want. 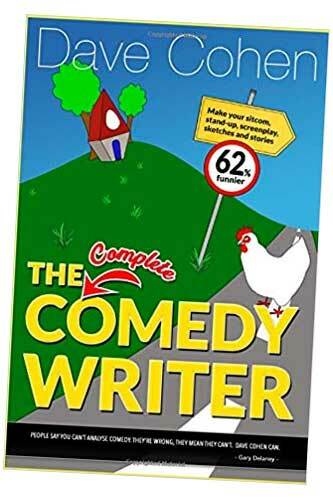 Some of his suggestions in The Complete Comedy Writer are certainly common to the plethora of other comedy-writing guides out there, so there’s plenty of overlap, and others are certainly more technical in terms of plotting and structure. But other questions you hear less often: such as precisely why is your lead character getting in to so many scrapes? He even debunks the ubiquitous ‘write what you know’ mantra - or at least puts it into proper context. Other tips include how cliches can be useful, how a thesaurus can be your friend, not just in the obvious way for writing good dialogue, but deployed while conjuring up your character’s traits, too. The book is split into broad sections focusing on characters, stories and jokes (This Chapter Contains Every Joke You’ll Ever Write one immodest heading boasts) as well as more practical considerations about the life of a writer and general essays and thoughts on the state of the business. These range from a musing on why writers are overlooked in favour of writer-performers, to a spotters’ guide to the two-dimensional female character tropes that so often occur in comedy (and indeed drama), which a sharp practitioner will want to avoid. These sections add a more personal touch, and tacitly accept there can never be a definite manual for something as unscientific as writing – whatever the title may suggest – only a sharing of first-hand experience. In another chapter, Cohen argues most sitcom characters are too thinly drawn, and while he doesn’t believe the answer is necessarily a thick ’Bible’ charting their complete backstory, he does offer a checklist that might flesh out the bones. One pro tip is to make them more monstrous than you think, even for a relatively realistic sitcom, as larger-than-life is the watchword. The Complete Comedy Writer is not just a guide to sitcom: there’s guidance on the vital proving ground of sketches; topical gags that are so often the gateway to a comedy-writing career; stand-up (though only superficially); and even non-verbal comedy, often overlooked by writers who underestimate the comic impact of someone falling over. Julian Dutton, who wrote the wordless comedy series Pompidou with Matt Lucas, contributes his list of the seven types of visual gag, while other quoted sources range from Aristotle’s The Poetics to Shakespeare to Harry Potter, with JK Rowling astutely aware of the importance of having fully rounded supporting characters. Who is Cohen to be offering such advice in such company? Well, he’s been around a long time: a stand-up in the early days of alternative comedy who wasn’t, by his own admission, much cop, and a founding member of the Comedy Store Players. But he started writing for the ‘mostly unloved’ Radio 4 topical show Week Ending – a precursor to the current Newsjack – and has been a jobbing ’averagely successful’ comedy writer ever since, including stints on Have I Got News For You, Not Going Out, and Horrible Histories. To match his career might seem a modest ambition but anyone who can make a living writing comedy is a rarity, those who make a name in the business one-in-a-million. Indeed his first bit of advice for any budding writer is not to bother, as chances are only disappointment will follow. Nowadays Cohen dubs himself, with entirely deserved embarrassment, a writerprenuer - a phrase he coined in a Chortle opinion piece. For this is the way things are today. Writing is not enough, you have to hawk yourself around embracing the revolution the internet has had in sweeping away some gatekeepers to get your own work out there. Aptly, The Complete Comedy Writer is a self-published book, which carries much less stigma than it once did. Cohen also interviews two men who have made money writing jokes on the internet, a near-impossible achievement, but something increasingly relevant to consider. He offers a little more self-analysis in the chapter entitled What Kind Of Scribe Am I?, an entertaining diversion more than a significant statement about the art of writing gags. Further prosaic practicalities of being a writer are raised in sections on embracing boredom, turning off the attention thieves of social media, and dealing with inevitable rejection. And this is probably the first book on comedy writing to point out that the uncertain employment, lack of safety nets such as sick pay, and other pressures of go-it-alone freelance work mean depression is almost an occupational hazard, and certainly something more aspiring and actual writers need to be more aware of. Kudos to Cohen for including some mental health warning signs. There’s no guarantee any of this will help comedy writers, but it’s a studied assessment of he job and the craft, combined with enough prompts on how to set up or improve your characters and your ‘sit’ that should spark the little grey cells if you’re serious about entering this vastly oversubscribed profession. • Dave Cohen: The Complete Comedy Writer: Make Your Sitcom, Stand-Up, Screenplay, Sketches And Stories 62% Funnier is available here, priced £9.99. • Dave Cohen is recording an episode of his Sitcom Geeks podcast at the Chortle Comedy Book Festival at the British Library on January 13 alongside co-host James Cary and bestselling satirical author Jonathan Coe. Full details of the event are here.